A while ago I did a series on pears. 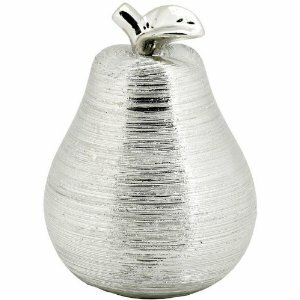 At that time I had bookmarked a silver pear available from Home Decorator's Supply. I liked it - a lot. But I had finished my posts on pears so it just sat in my Evernote files. This morning I got a regular email from Home Decorators and that pear was on a big special WITH free shipping. Bingo. It's mine. In fact I ordered three - two small and one large. Looking forward to finding a nook for them.